Last week was in Bangalore on Thursday for a show at The Kitchen Yatra. The range of modular kitchens now available for us is really mind-boggling! On Friday, we all took some time off from the rush of shootings to watch an enchanting demonstration of the unique food processor called Thermomix. The presenter was a very enthusiastic Ms Lynette MacDonald from Australia and we could see that she loves what she does….creating magic in the kitchen showing the prowess of the smart little Thermomix. Lynette was kind enough to teach us how to make dessert with frozen strawberries, pineapple sorbet, coleslaw salad, sweet custard, fresh bread dough, soups as well as preparation of our very own Indian masala mixes. My whole team thoroughly enjoyed Lynette’s demonstration as it was peppered with little jokes. 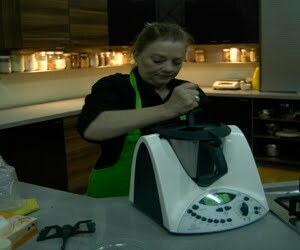 What we saw was this machine Thermomix that weighs, cooks, chops, steams, kneads, simmers in a compact way. Frankly speaking, the gadget lover in me was totally floored! Monday comes with its long list of things to do and shows to make! From tomorrow a shooting schedule for Khana Khazana starts and I am spending time in preparing my recipes for it. February is packed with lovely things on www.sanjeevkapoor.com! You can stock up on soup recipes and dish out great recipes using carrots….there is more, just wait! The new book The Wedding Collection is bringing in excellent feedback for its concept and a niche market. Have you got your copy yet? In the Konkan region, weddings spell hope, joy and permanence of relationships. Agarbattis and silver lamps are all around the dining area and with devotional chants the meal begins. The meal is usually vegetarian and is served after the wedding ceremony is over. It is a common custom to draw a colourful pattern rangoli with white flowers around the taat (plate). The wedding feast is generally served in a taator on a banana leaf in a specific order. There are chutneys, salads, dry vegetables, gravies, plain rice, puris, and a sweet dish like jalebi, creamy basundi or saffron flavoured shrikhand. Mattha or coriander-leaf-flavoured-salted-buttermilk complements the meal which ends with a sweet paan called beeda. The arrival of a baby is awaited with bated breath and lot of expectations. The Gods’ blessings are invoked for the health and safety of both the mother and child through almost the entire period of pregnancy. In the seventh month of the first pregnancy, a function called oti bharane is held when several married ladies gather together to bless the mother-to-be with coconut, whose auspiciousness is well known. On the 6th day after the birth of a child, khichdi is made of moong dal and rice along with jaggery and cashew nuts. It is believed that on this day God comes to bless the newborn. Small children are invited and served with kheer and khichdi. On the 12th day, the naming ceremony of the newborn – the barsa – is celebrated with a lot of joy and festivities. Some people have a havan followed with a festive meal followed by the cradle ceremony, when the newborn is put into a decorated cradle and given a name. The cradle ceremony is held in every family. On the 12th day after death, a meal is served to the Brahmins when relatives are also invited to partake in it. It is believed that on this day the departed soul moves away from the material world into the heavenly folds. There are some specific dishes, which are made only on this occasion, and otherwise considered a taboo. While rest of India celebrates Raksha Bandhan on the full moon day of this month, the people of Konkan celebrate Narli purnima or coconut day. The day is thus called as coconuts are offered to the sea. This is done mainly by the fisher folk to appease the sea God and pray for their safety before resuming fishing season after the peak of monsoon when they do not venture into the choppy seas. Soon follows Janmashtmi or the birthday of Lord Krishna. Most devotees fast till midnight when the birth of the Lord is announced, thus calling for a festive meal comprising of dishes, which, according to mythology, was liked by Krishna and his playmates in Gokul. This meal includes rice, butter, yogurt, puris, dahi pohe and a special vegetable made of potatoes. Amboli, a pancake similar to that of uttapa but a little thinner, is consumed with a bhaji made from leaves of drumstick tree since they are considered auspicious. On this festival night, children have a special place in every household. They are given plenty of butter and puffed rice mixed with sweet milk.Ganesh Chaturthi, perhaps the most important festival of this region, is celebrated around end August-September. This is the feast of elephant-headed Lord Ganesha, the God of wisdom and the benevolent deity. Ganesha’s blessings are invoked at the commencement of every occasion. Lord Ganesha is the presiding deity of this region. A clay replica is brought home and worshipped from 1½ days to 5, 7 or 11 days, that is till Anant Chathurdarshi. On the last day, the deity is taken out in a joyous procession and immersed in flowing waters. This is called visarjan (immersion). Along with Lord Ganesh, the people of Konkan also worship Gauri – the Goddess Parvati – Lord Ganesha’s mother. Ganesh Chaturthi is a day of great feasting. Special sweets called Modaks are steamed or fried for offering to Ganesha. Modaks are small rice or wheat flour dumplings stuffed with coconut and jaggery. Besides this, a large variety of savoury and sweet snacks such as shevian, karanjis, laddoos, chaklis, kodbolis and anarsas are distributed to devotees and guests during the puja. On Rishipanchami, or the day following Ganesh Chaturthi, food grains that are produced on fields which are ploughed by the bullocks are not cooked. Hence only vegetables are used. The special bhaji is made with colocassia, green and red leafy vegetables, potatoes, yam, colocassia leaves, padval, etc. Slit green chillies are used for flavouring and garnished with grated coconut, coconut oil and triphal. Puja of Sapta ( seven) Rishis is also performed on this day. Dassera, which generally comes in October, is considered a very auspicious day for any new beginnings. Many children begin their education, their dance or music or art or sport lessons on this day. New journeys are planned and elders are respected in a ritual, which is touching, as it is interesting. On Dassera, a special dish called Kesari Bhaath and Puran Poli are made. Soon after Dassera, comes the wonderful festival of lights – Diwali. The commercial city of Mumbai becomes a magical fairyland with scores of twinkling lights and Akashkandils hung in front of every home. The colourful electric lights decorate the buildings and fireworks assert the festive mood. During these five days, elsewhere in Konkan too, Diwali is a festival of twinkling lights and bursting crackers. Mouth-watering snacks, with a variety of sweetmeats, are made by every family. A special feature of Diwali in Mumbai is the identical paper lanterns which children make to light up homes in a building. This practice shows the community spirit of the festival. Many communities hold sports, arts, drama and cultural events to celebrate Diwali. Among the various savoury and sweet preparations made, some are Besan laddoo, chaklis, shankarpale, chivda, papdi, anarasa etc. Tulsi Vivah, marriage of Tulsi and Krishna follows Diwali, towards mid December. The celebrations go on for three days after which comes the Dev Diwali i.e. Diwali of the Gods which goes on for a month which is considered auspicious. 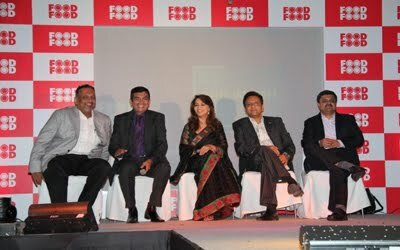 It gives me great pleasure to announce the launch of long-awaited FOODFOOD 24 X 7 channel today at 2 PM!! FoodFood is not just a food channel, we are here to provide Indian viewers their very own Khushi ki Recipe! We have a huge platter to offer to all our foodie fans: Sanjeev Kapoor’s Kitchen, Chef se Hai Muqabla, Sirf 30 Minute, Ready Steady Cook, Firangi Tadka to name just a few…. Two more days! There is anticipation, excitement and enthusiasm for the launch of the Channel. I will take a few minutes out from my hectic day and connect with you. Yesterday we did what is a small tradition for me and my team. It might be a small gesture but in life small gestures matter, don’t they? 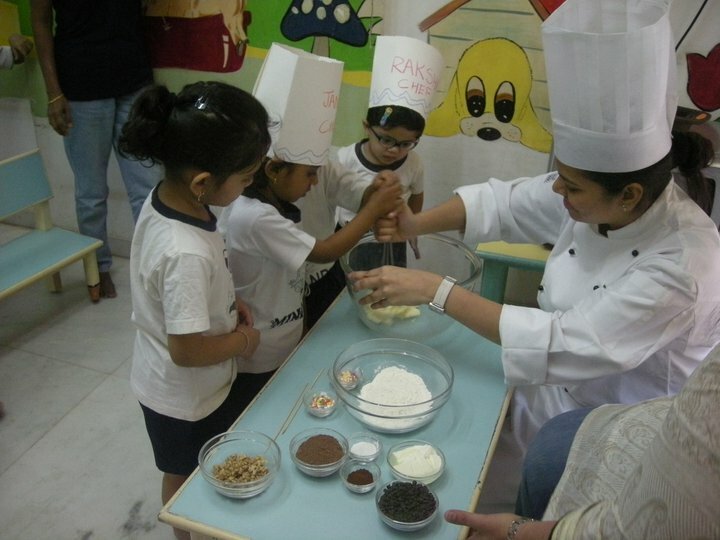 Since many years my team has been having a Bakers’ Day at a nursery school in Juhu . It has become a huge highlight in that school! Our chefs enjoy it, so do the kids and teachers. Even tiny tots have hidden talents, and they all love to handle kitchen equipment. The pics reveal the fun factor! For the weekend, try some different dals with rice. The people of Konkan region celebrate a host of national as well as local festivals. Added to this are the numerous family occasions like birth, child naming ceremony, thread ceremony, engagement ceremony, marriage, etc. which express the locals’ love for festivities and celebrations throughout the year. Being a predominantly agricultural region, most of the festivals occur during the monsoon, when a rich harvest is promised by nature and when plentiful of fruits and vegetables grow. On festive days, Konkani people make sweets from rice flour and liquid jaggery. Some of these are eliappe, shevais served with sweet cardamom flavoured coconut milk or Patolis, which are packets of steamed rice flour with a sweet coconut filling. There is a large variety of ghavans, which are like dosas, eaten with dry or fresh chutneys. The Konkan coast is short of milk, therefore sweetmeats are made of rice, wheat, besan or coconut. Gudi Padwa or Ugadi is the first day of the springtime month of Chaitra heralding the New Year. This festival coming around March-April is typical of this area, as it commemorates the triumphant expeditions of the Maratha armies of Chhatrapati Shivaji Maharaj. Even in the present day every household in this region raises the ‘gudi’ or standard of victory comprising a pole with an upturned metal pot surrounded by folds of silk fabric, marigold and mango leaves. Gudi Padwa is considered as an auspicious day for marriages, house warming and any new beginning. Homes and the entrances are decorated with torans (garlands) of marigold, flowers and mango leaves. Sweets are distributed among the neighbours and relatives. Shravan, at the peak of monsoon in August, is a month of festivals starting with Nag Panchami when people worship the snake God. Various milk sweets are made and offered to the deity. People avoid cutting, frying, etc., hence vegetables are cut a day before by many followers. The celebratory meal cooked on this day includes Puran Poli, Kheer, jaggery flavoured Moong dal khichdi, a dessert called Dhondus and several vegetables and pulse preparations.